Speaking to representatives of more than 40 Asian parliaments on Wednesday, Prime Minister Hun Sen questioned the “double standard” that he said the West applies to other countries, before offering up his thoughts on Syria’s ongoing civil war. 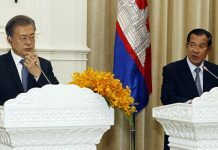 In an address to a meeting of the Asian Parliamentary Assembly (APA) at the Sokha hotel in Phnom Penh, Mr. Hun Sen said that he had been spurred to deviate from his prepared remarks after listening to an impassioned speech by nationalist Pakistani politician Raza Rabbani, who preceded him at the podium. 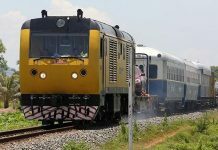 Noting the attention given to last month’s attacks in Paris, the downing of a Russian airliner over Egypt’s Sinai Peninsula in October, and last week’s mass murder in California, Mr. Hun Sen said it was apparent that acts of mass violence in Asia received significantly less attention than those in the West. “We have to see this point: The Pakistani people, and people especially in the Middle East, many die every day, but not many people notice that,” he said. Continuing off script, Mr. Hun Sen pondered whether the time of “color revolutions” had come to an end given the turmoil left in the wake of the Arab Spring. Mr. Hun Sen then turned his attention to the more than four-year-old conflict in Syria, telling the audience—a number of whom represented countries that have supported the armed opposition to Syrian President Bashar al-Assad —that he had confronted U.S. President Barack Obama over the U.S.’ policies in the devastated nation. “At the time the regime of Assad attacked ISIS, the intervention led by America also attacked ISIS. Naturally it is an alliance. But at the time, they acted to weaken the Assad regime, which gave the strength to ISIS,” Mr. Hun Sen said, rehashing a meeting between the two leaders at the 2014 Asean Summit in Naypyidaw. 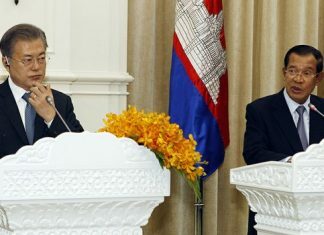 Mr. Hun Sen concluded the unprepared remarks with a warning that Cambodia needed to avoid becoming a “safe haven” for Islamic State group militants, before adding a quick apology. “Sorry that I raised this issue. I’m very interested in it,” the prime minister said, shifting back to his planned speech.